L to R- (Standing On Wing) :Vm. H Davis, Wm. Kramer, Irving Sly, [on Prop= E.O.Fisher], Jack Conatser, Roy Christian, Frank Connor. 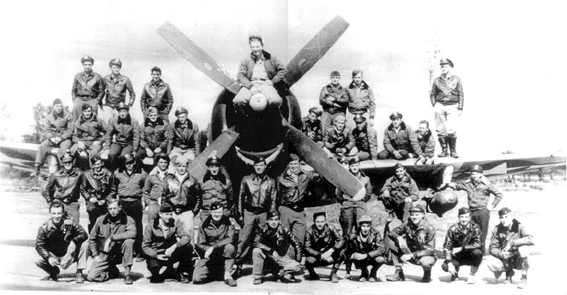 (Sitting on Wing) : Alvin Hogberg, Robert Reed, Francis Korosy, Carvel Artley, Duane Oyster, Don Clark, Robert Morison, Fred Ford, Jack Barensfeld, Roy Barker. [center- Russell Fairbanks], David Childs, Ernest Johnson, Robert Racine, Gardner Cole. (Front Row): Major Tom Liston[Squadron Commander], Major Tom Beeson [Operations Officer], Robert Bergren, Dr. Lane Mays, Robert Collins, Artemus Davis, Fred Humphries, Edward MacLean, Robert Clees, Roland Wisdom.